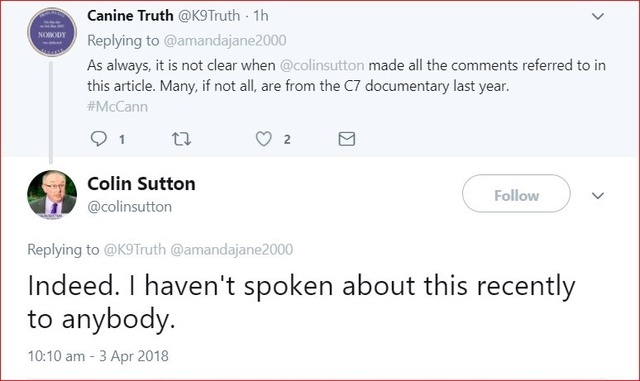 Mutton can barely conceal her obsessive hatred of Kate McCann. Too funny! Rather than just admit their idol, er, misremembered, the hounders are now inventing fresh conspiracy theories involving photoshop and CGI to explain away the undeniable fact that yes, he DID meet the Aussie news crew. I take it that he must think that all those horrible photoshopped pix that the usual suspects have done about the McCanns are real? Retired Amaral, who was removed as head of the probe after criticising British detectives, claimed UK authorities tried to rush the process. He said: “It is not normal for an ambassador from a foreign country to come to the place to push in the sense that ‘this has to be quick’. Effing nutcase. The McCanns aren't aristocracy, just NHS doctors from working-class backgrounds. And I should think that the Embassy went to PLD with great speed when they found out that, shamefully, Arguido Amaral had been put in charge of ANOTHER missing child case. Does the porcine-faced perjurer seriously think the Embassy didn't know he'd been charged with torturing the mother of a missing child just hours before Madeleine vanished? No. No, Bonny. He was possibly expecting that it would have been hushed up and pushed under the carpet like most things in Portugal. Did Gonzo seriously think the British Embassy hadn't seen this? A PJ officer from Portimão is the seventh policeman to be implicated in the alleged assault of Joana's mother. Gonçalo Amaral, coordinator of the Judicial Police of Portimão, was accused in the case investigating the alleged assaults on Leonor Cipriano, which occurred in October 2004. The woman complained of being beaten, kicked and with a cardboard tube During "informal interrogations"? Which will have taken place without the presence of the defense lawyer and without the knowledge of the public prosecutor investigating the disappearance of the eight-year-old daughter of Leonor. Gonçalo Amaral was at that time coordinator of the PJ of Faro and that was why he was constituted defendant. Six inspectors of the Central Direction of Fight against the Banditismo are also defendants and have already been to a line of recognition. Four were not recognized by the complainant, who identified the other two but cleared them of the assaults. Leonor Cipriano was sentenced to 16 years in prison for the homicide, in co-authorship with her brother, Joana. The child's body was never found. Look at the date on it. Oh, how Gonzo must resent not being able to 'help' Kate McCann on those dangerous police station stairs. You know, I reckon Gonzo must have been watching British telly too much, and thinks the McCanns are like Lord and Lady Downtown Abbey, or something, just cos the British Embassy wouldn't let them have accidents on those slippery stairs. We mustn't forget the Volcano Theory! To see how reality-challenged the haters are, one only has to look at the garbage they invented yesterday to try to explain away the fact that their adored Gonzo HAD appeared on the Aussie documentary. They dreamed up scenarios involving CGI, green screens, an actor impersonating Gonzo - anything rather than admit that the object of their adoration had, er, misremembered. Who knows why? Maybe the Aussies had treated Gonzo to an especially fine beer'n'shrimps lunch. No wonder, they ARE stupid. What Ever Happened to Profiler Pat Brown's Lawsuit against Rahni Sadler and Seven West Media? You'd need a heart of stone not to laugh! Colin Sutton told a documentary that Maddie’s corpse could be buried down any one of 600 ancient wells near Praia da Luz, from where she vanished in 2007.